Blu-ray and DVD drives are being kicked out of PCs but finding a new life in data centers as storage that can retain data for up to 100 years. A massive new system from Sony called Everspan is a collection of optical drives that can store up to 181 petabytes of data. The system can expand to 55 feet in length and have hundreds of Blu-ray-like drives. The system will be used for long-term storage of data that isn't modified often, or information that businesses feel need to be retained for specific reasons. Everspan was announced and shown for the first time at the Open Compute Project (OCP) U.S. Summit 2016 this week, and will start shipping to customers in July. Everspan will store data on media called Archival Discs, which will initially have 300GB of capacity, with 150GB on each side of the disc. The capacity will grow to 1TB over the next five years. That's a big advance over Blu-ray discs available today, which have a maximum capacity of 100GB. The first CDs came out in 1982 with a capacity of 650MB, and DVDs came out in 1996 with a capacity of 4.7GB. Optical storage has advantages over hard disks and tape storage, which are the prominent forms of long-term storage in data centers, said Horst Schellong, vice president of sales at Sony Optical Archives, during a presentation at OCP. "We have tape, we have hard disks, but the life of the technologies does not meet the life of the data," Schellong said. "We give a 100 year ... warranty on the storage medium." In data centers, the discs could be useful to store movies, which don't require modification. The movies can be pulled out and streamed to customers over the Web. They could also be useful to store medical data, or for companies looking to retain data to meet compliance requirements. Facebook has used an experimental optical storage system to back up data. Sony hopes to push Everspan to data centers, cloud companies, national laboratories and banks. Blu-ray drives are notorious for slow read and write speeds, and burning data to discs can be time-consuming. While Sony uses blue lasers at the same wavelength used for Blu-ray, it has increased the speed and reliability of Everspan drives with technology improvements. The drives burn data to media using eight lasers, which is more than the one laser on consumer Blu-ray drives. Each laser has a transfer rate of 45MBps (megabytes per second), and eight lasers burn data simultaneously. Sony says the drives have an average write speed of 140MBps, and a read speed of 280MBps. The speed of optical drives in Everspan is comparable to hard disk or tape drives, Schellong said. 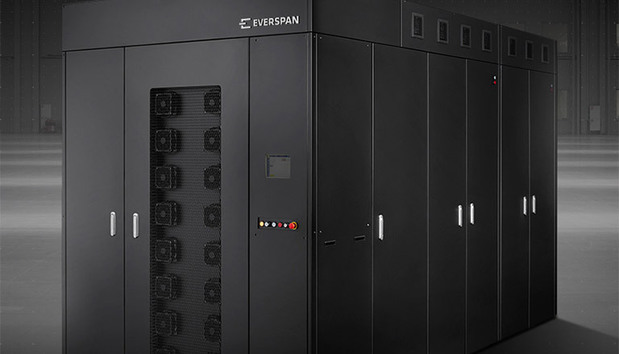 The cost of storing data on Everspan is lower than the $0.05 to $0.06 per-gigabyte cost for hard disks at the rack level, claimed Schellong, though he didn't provide a specific amount. The optical backup system is more reliable than tape or hard drives and there is lesser chance of data failure, Schellong said. The storage media is never touched, unlike hard drives or tapes, giving it a longer life. For reliability, Everspan borrows technologies from magnetic drives. Such technology includes erasure encoding, which is key to ensuring data integrity. Sony and Panasonic will be the only companies manufacturing Archival Discs, and that's partly to ensure quality control so media can meet the 100-year guarantee. The companies want to avoid mistakes made with consumer technology like Blu-ray, where discs frequently were marred by production glitches. "We want to avoid this," Schellong said. The optical drives work on the SATA interface, but convert the signals to the iSCSI protocol. Everspan has interfaces so tape drives can be used in the system.